At a recent Gardens Illustrated lecture nurserywoman Beth Chatto brandished aloft a gladiolus. Her actions were reminiscent of Dame Edna Everage but Mrs Chatto’s elegant flower was as different from Dame Edna’s overblown blooms as the two women are from each other. While the antipodean drag queen showers her audience with gaudy, puffed-up hybrid ‘gladddies’, Mrs Chatto sings the praises of the delicate charm of species gladioli. A preference for growing species plants conjures a geeky subculture, like listening only to music composed before 1720. Beth Chatto has spent a lifetime moving species plants out of this ghetto and into our gardens by demonstrating that the simplicity of species plants makes them as much at ease in the garden as they are in the wild. The difference is between listening to Handel played sensitively by a period-instrument ensemble or given the over-the-top full symphony orchestra treatment. This contrast is clearly seen in the Gladiolus genus: trussed-up hybrids with bright, blousy flowers that are difficult to place in the garden; against enchanting small-flowered species that combine effortlessly with other plants. The tall, flamboyant gladioli hybrids have been bred for the cut-flower market and for exhibitions, not for growing in the garden. Even if their gaudy colours and extravagant shapes could be fitted into a planting scheme, the need to stake individual plants make them look out-of-sorts in relaxed plantings. The gladiolus Mrs Chatto waved about was G. tristis, whose pale-cream flowers have a green hue and are sweetly scented, especially at night. In Britain the plant is only hardy in very well-drained soils but it is easy to grow in large pots that are kept well-watered during the spring and stored in the greenhouse over winter. G tristis var tristis has chocolate-coloured markings on the throat of the petals and G trisitis var concolor has pale-yellow flowers. 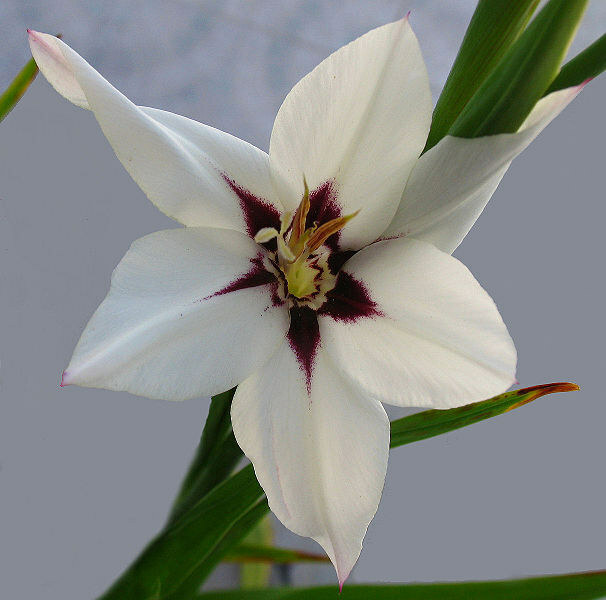 G. tristis is one of 250 species of gladioli that originate in sub-Saharan Africa, mainly in southern Africa. They all grow in rich, well-drained soils in sunny locations. On most plants the flowers grow on one side of the stem and the individual flowers are perfectly symmetrical: zygomorphic, a botanist would say. The plant grows from a corm, formed from the swollen base of the stem. Each year a new corm forms on top of the old one and tiny corms, known as cormlets grow around the base. So numerous are these cormlets that some species can form large colonies. The magenta flowers of G communis subsb byzantinus may look beautiful carpeting meadows in their native Mediterranean and North Africa but elsewhere they have become an unwelcome pest. In parts of North America and central France they have escaped from gardens and are muscling-out native species from meadows and hedgerows. In most of Britain the climate is too wet for them to become a menace. The true form is an invigorating, strong magenta colour, but you see lots of wishy-washy pink impostors for sale. Planted in drifts in the border or dotted through long grass the true form is energetic and exciting; the pale imitations merely dull. In milder areas of the country G papilio also has a reputation for being an invasive thug, though not, alas, in my garden, where it only thrives in pots that are protected from the cold during the winter. The flowers are more bell-shaped than most gladioli: greenish-yellow pixie hats suffused with a purple wash. G. callianthus is much more difficult to bring through the winter – fortunately the corms are inexpensive, so I buy new ones each year. It doesn’t flower until September and despite its 1m tall stems doesn’t need staking. The bright white flowers have a plum central zone and smell of cloves and spices. The scent is so delicious that it’s hard to keep your nose out of the flowers. 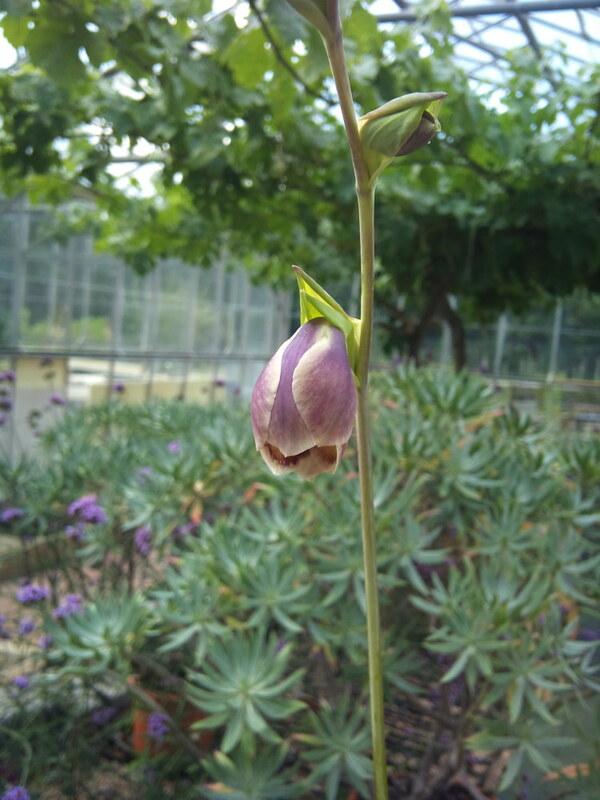 G. callianthus has gone through several name changes and you may still find it being sold under one of its former names of Acidanthera bicolor. The most unusual colour in species gladioli is the dark violet-blue of G. atroviolaceus. It is only a foot high but the stem is full of flowers. In the gardens of south-west Scotland and other mild areas it will overwinter, but the rest of us will need to lift the corms and store them in a frost-free place. Most gladioli thrive in full sun and well-drained soil but G cardinalis needs some shade and a moist soil. In its native South Africa it is known as the Waterfall Gladiolus, after its preferred habitat. It is a hardy species with, as its name suggests, cardinal-red flowers. This species has been crossed with G tristis to produce G x colvillei which has the robustness of cardinalis and the delicate flowers of tristis – although the scent has disappeared in the crossing. There are two white forms of G x colvillei: ‘The Bride’ and ‘Albus’. Both are hardy in a well-drained soil and form large clumps about 18 ins tall with flowers during June and July. ‘Albus’ is the brighter white of the two but does have a yellow stripe on the lower petals. Appreciating species gladioli doesn’t mean that we have to exclude the hybrids and cultivars. There are over 10,000 of them, so there are bound to be a few that are appealing. The genus is so large that it is sub-subdivided into several catagories, the three main ones being Nanus, Primulinus and Grandiflorus. The Nanus group has two or three slender flower spikes about 12 inches tall in early summer. It has a loose habit and the stems tend to bow forward. Most of the Nanus group cultivars have red, pink or white flowers. On the white-flowered G. ‘Prins Claus’ the three lower petals have the lipstick stain of a kiss from Dali’s Mae West. G. ‘Nymph’ is similar, with just the outline of the lips. Flowering into late summer the Primulinus group has self-supporting stems up 30 inches tall with about twenty flowers on each stem. They are not hardy and need to be lifted during the winter. Bred in the 1940’s and very popular since, G. ‘Atom’ has pillar-box red flowers with each petal edged in silvery-grey. G. ‘André Viette’ is similar, with larger, paler flowers. Primulinus are available in the wide range of colours associated with gladioli: ‘Lady Eleanor’ is pale orange, ‘Ivanhoe’ soft pink and ‘Mrs M Rowley’ burgundy-red. Several plant breeders who have, in the past, concentrated on producing gladioli for the show bench have finally cottoned-on to the idea that the Primulinus group are great garden plants. Look out for new cultivars over the next few years. The Snoek family have been breeding gladioli for the show-bench and the garden for decades. They are based in Flevoland, Holland, and many of their best garden hybrids contain the name ‘Flevo’. G. ‘Felvo Jive’ has ruffled yellow petals and flowers in early summer. I grow it through the dark-blue flowers of Anchusa ‘Loddon Royalist’. The strong stems of the Anchusa help support the gladiolus. Lime green and purple on the same flower may sound an unlikely combination but looks gorgeous on G. ‘Flevo Cosmic’. Not a plant for the faint-hearted, it’s become my favourite gladiolus. As for those big and blowsy Grandiflorus plants, try growing them in large pots. A friend fills old dolly-tubs with them and they do look impressive, although they still need staking. If you want them for cutting, best grow them in rows in the vegetable garden as the French do. Getrude Jeykll wrote that they could be grown in ribbons through the border. This works well with G. callianthus but I can’t imagine what varieties Miss Jekyll used or how she supported them. One of the biggest plant breeders at the time she was writing was Victor Lemoine in France. He was proud to have produced gladioli with individual flowers six inches wide. Most of his introductions have disappeared; the delicate G. tristis advocated by Mrs Chatto is still growing strong. During humid weather botrytis can affect plants that are planted closely together. The first signs are dark blotches on the leaves, especially near to the base. Cut off the affected foliage and destroy it. Don’ put the leaves on the compost heap as this may spread the problem. In very hot and dry summers a tiny insect called a gladiolus thrip can attack plants. What begins with a few silvery spots on the leaves develops into spotted flowers and flowers that become distorted and fail to open. The only solution is to pull out the plants and destroy them, corms and all. I’ve noticed that the thrip problem is worse when the corms have been lying around and are planted late. Gladioli need a rich well-drained soil and an open, sunny position. Plant the corms about 5 inches deep in March and April. The later you plant them, the later they will flower.. The hardy species and the Nanus varieties can be planted in October if the ground is not freezing. Frost sometimes knocks-out early growth, but the plant soon recovers and flowers. On heavy, wet soils put some horticultural grit into the bottom of the hole. Lifting and storing the corms over winter has none of the palaver of overwintering dahlias or cannas. Lift the plant in October (before the ground freezes if you live in a very cold area) and either pull the stem away (it is dry) or cut it off close to the corm. Clear away any soil and lay the corms in seeds trays. Keep them in an airy, cool place such as a shed or garage that never freezes. Remember to label them with the name of the variety and hope that the mice don’t get at them during the winter. The little cormlets can be grown-on in pots but will take about three years to flower.